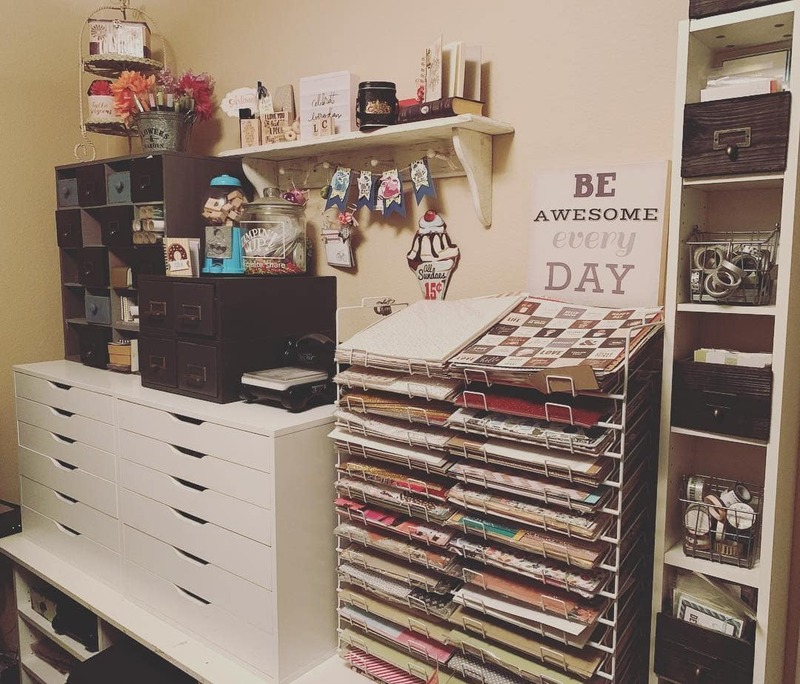 Organizing your craft room is essential to your creativity and sanity. 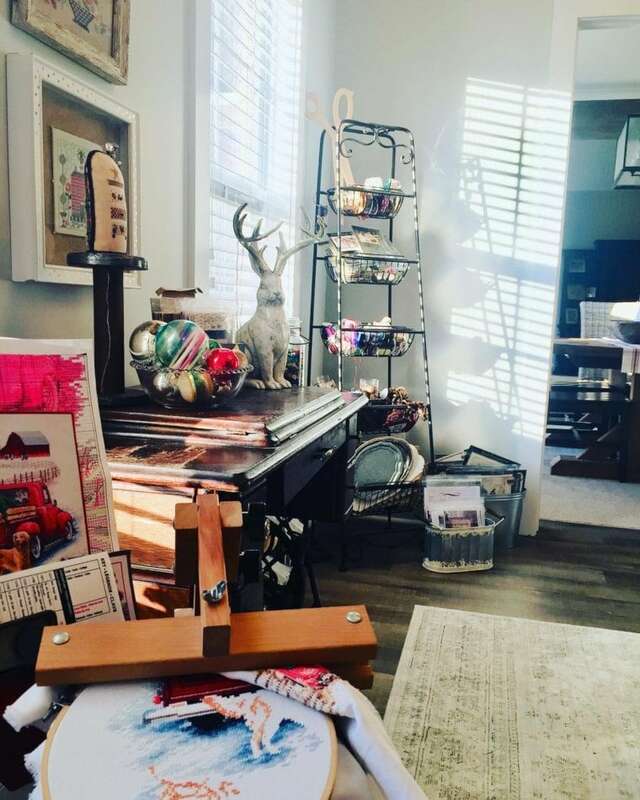 A craft room can truly get messy once you’re in the works of creating something truly beautiful or practical. That’s why keeping it organized is very important. There is nothing better than feeling inspired in a place where you feel safe. And the organization can give you a sense of safety! If not that, it’ll definitely save you time! 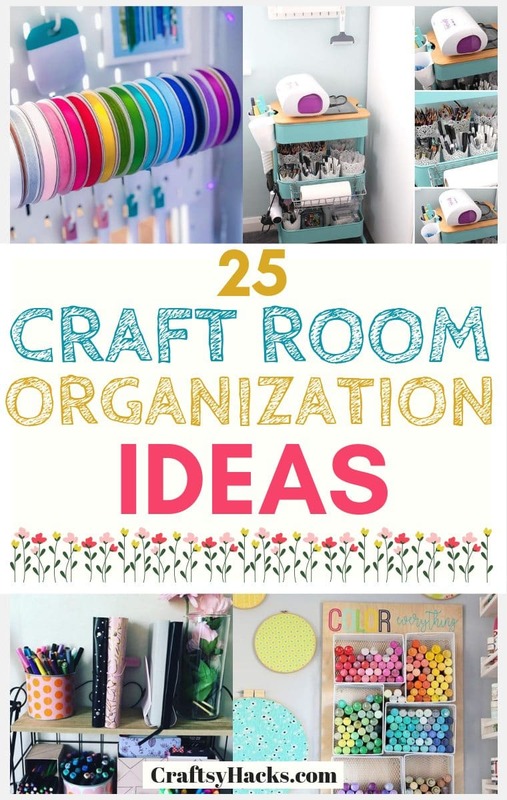 Today I’d love to share craft room organization ideas that will keep you organized and hopefully inspired. Getting wooden drawer storage units can get very expensive. That’s where plastic drawer units come in useful. They come in various designs and sizes. Here are a bunch of options to choose from. 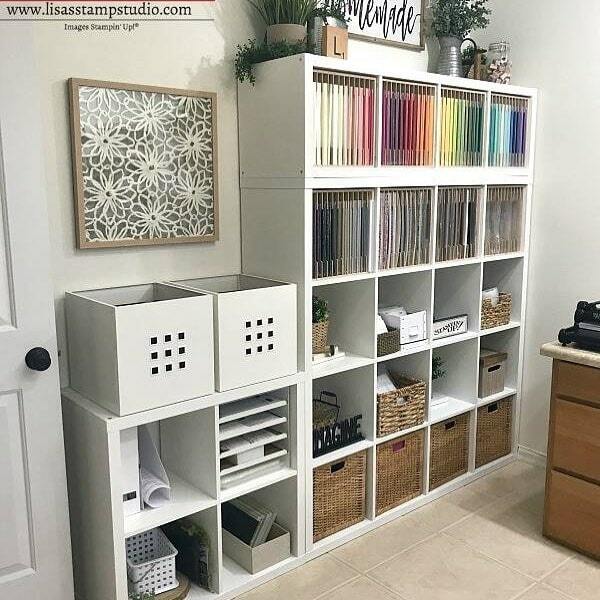 While these drawer units offer a good way to store all your supplies in the craft room, they can make things look messy. That’s where a little bit of diy’ ing can come in handy. Slid in a colored paper in front of the drawer. In that way, you can separate your supplies by color. Adding labels is also an option. 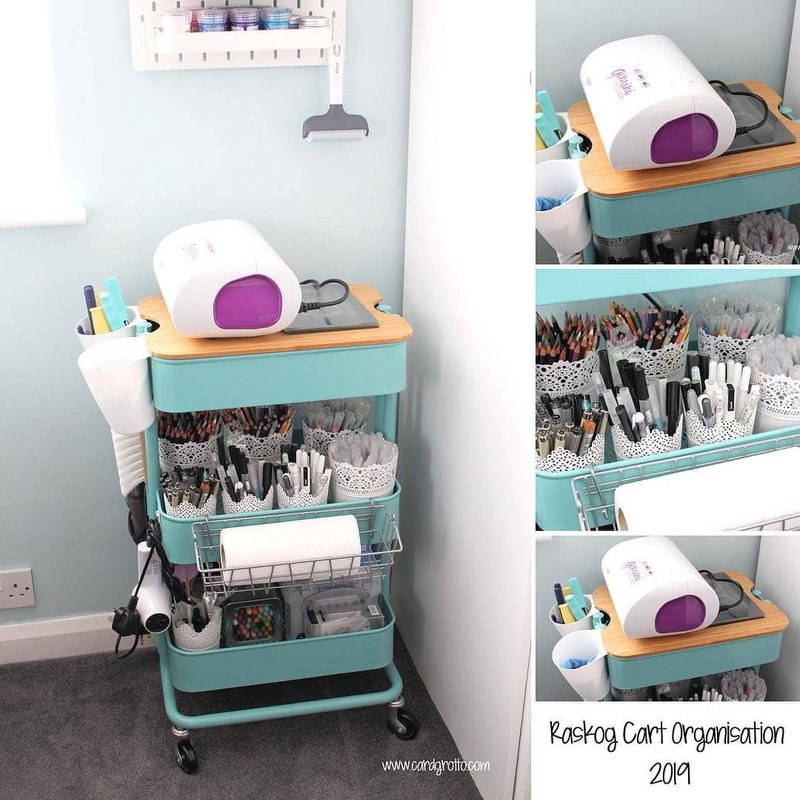 Overall, it’s a great way to keep your craft room looking a little bit more organized. Plus, it’s just a great way to introduce more color into your room. After all, it’s a craft room and it’s supposed to get your creative juices flowing. 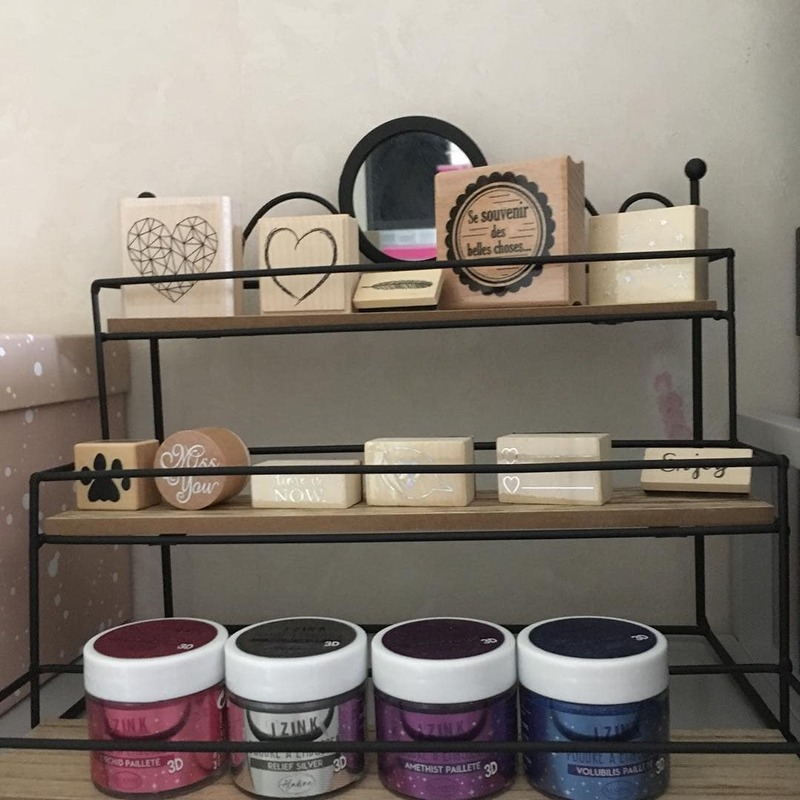 If you love to display your supplies on the table, get a display rack stand. 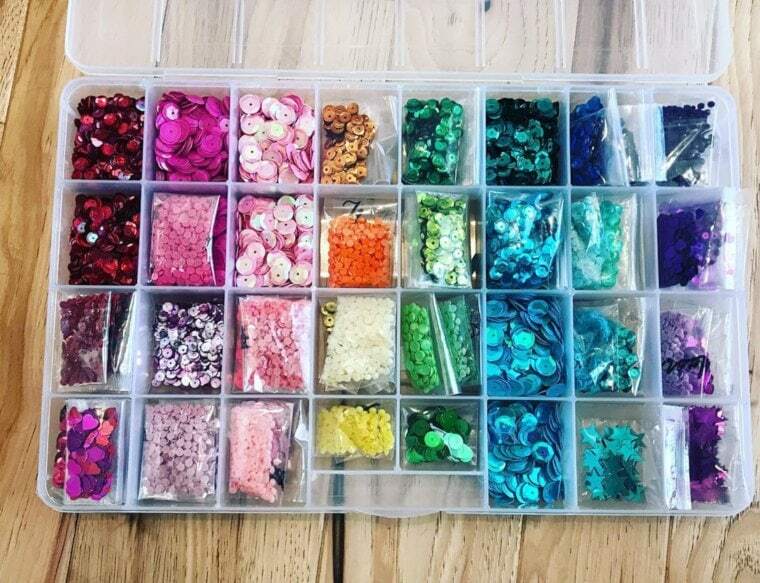 These are great for threads, nail polish, paint, glitter, etc. Here is a cute plastic rack stand I recommend. 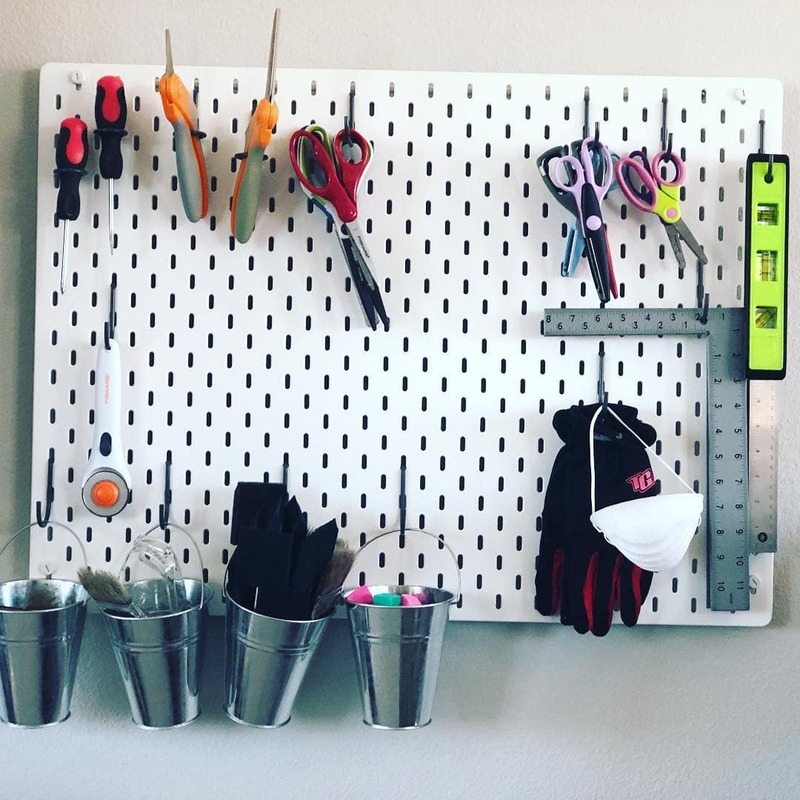 Everyone who lives in a small space should have a pegboard. There are multiple reasons for it. First, it offers a very practical way to store even the smallest supplies. Second, it will give you a chance to use the vertical space you wouldn’t be able to use otherwise. Third, it looks pretty fancy. There is a bunch of pegboards to choose from here. Get a few baskets and hooks to increase the storage space and get everything organized. Use table top storage shelves to increase storage space in your craft room. Especially if your craft room consists only of one corner. In that case, every inch of it is precious. So, you might want to use the space on your table to keep some of the supplies. Obviously, make sure it doesn’t get too messy. You know how easy it is sometimes to just throw everything on your desk! Here is an example of a wood stair shelf that you might potentially like. 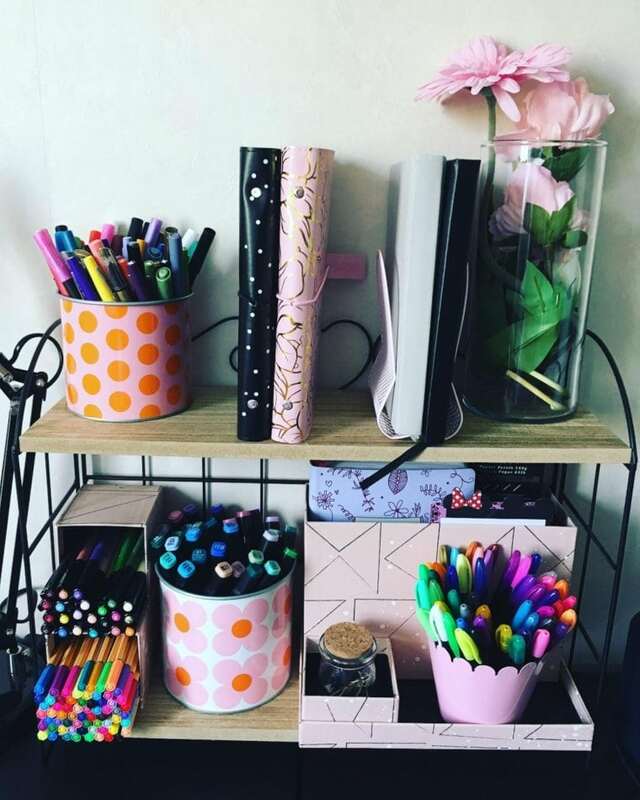 If you have a bunch of markers, brushes, scissors and other smaller items that you could just throw into a bucket, try this organizer. 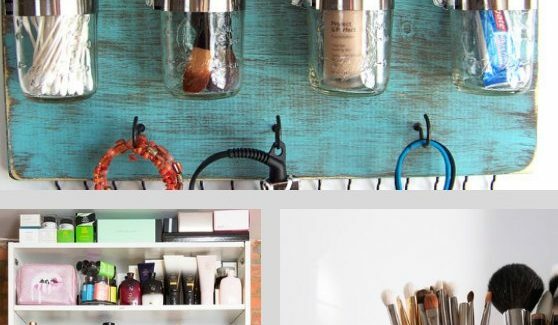 You could just fasten this wall organizer to the wall and throw everything in. What are the benefits of it all? You’ll have everything in one place and you’ll finally start using some of the vertical space. All of it will come in super handy especially if your craft room is very small. Who said necklace organizers are only for necklaces? Not at all! 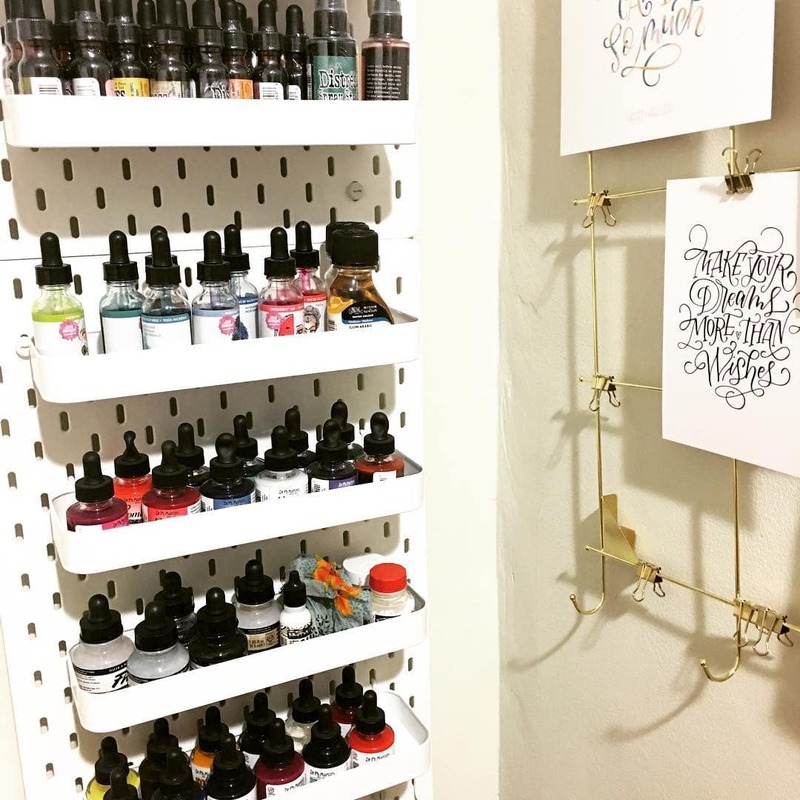 Here is a great example of how a necklace organizer can be used to hang your supplies. Try this standing necklace organizer or you could always opt for a hanging wall organizer too. Either of them can help you store your supplies better. 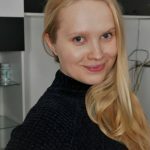 I’ve actually written a whole post on the sewing projects that could help you stay organized. Read it here. 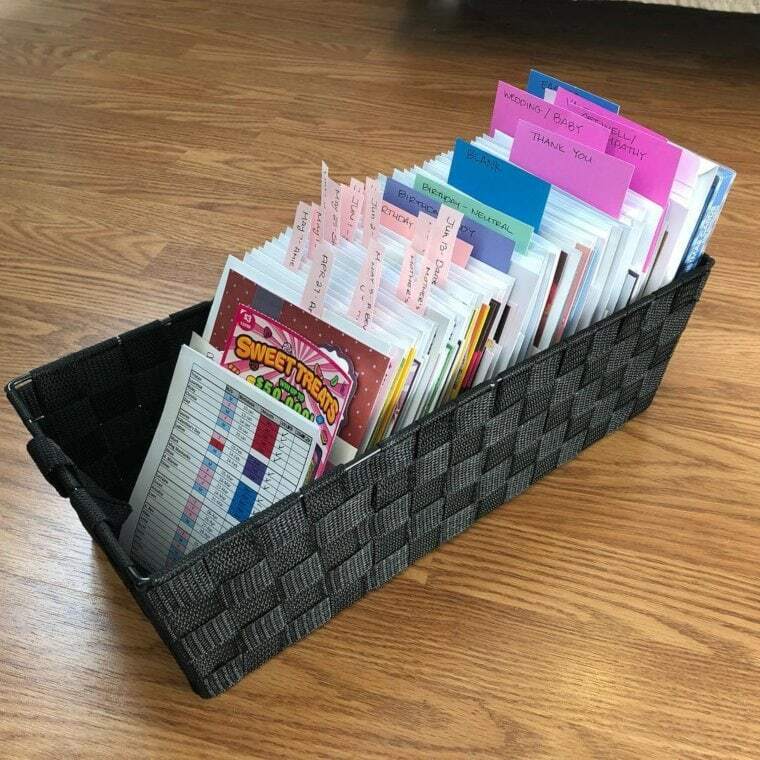 Anyway, fabric storage baskets offer a great way to organize all your items. They’re great for storing threads, ribbons, wool, etc. They won’t take up a lot of space either! 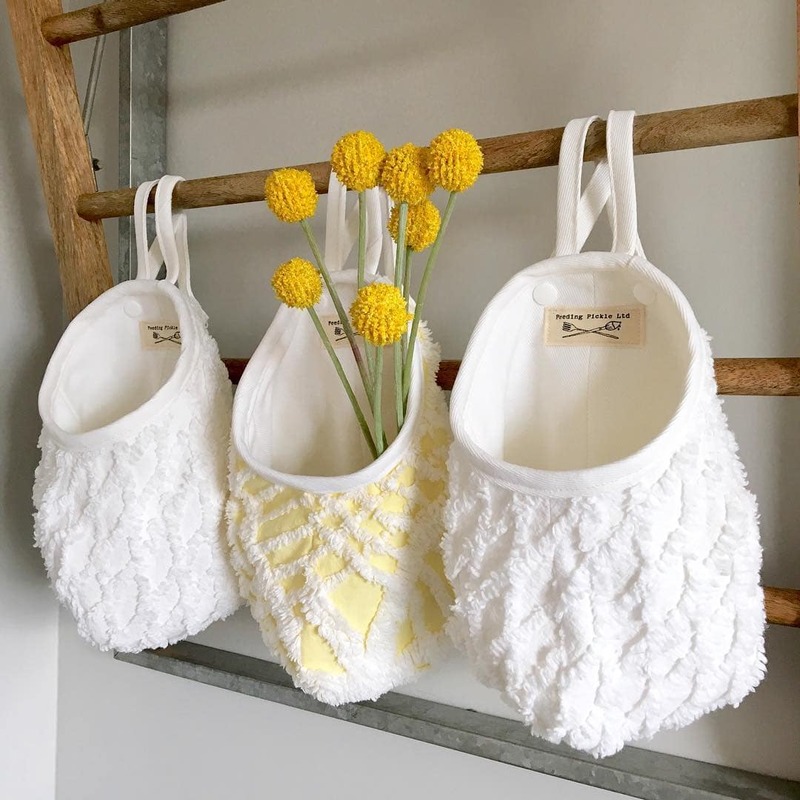 If you cannot really sew, you can always buy a few storage baskets like these oneshere. They’re pretty cheap and look awesome. 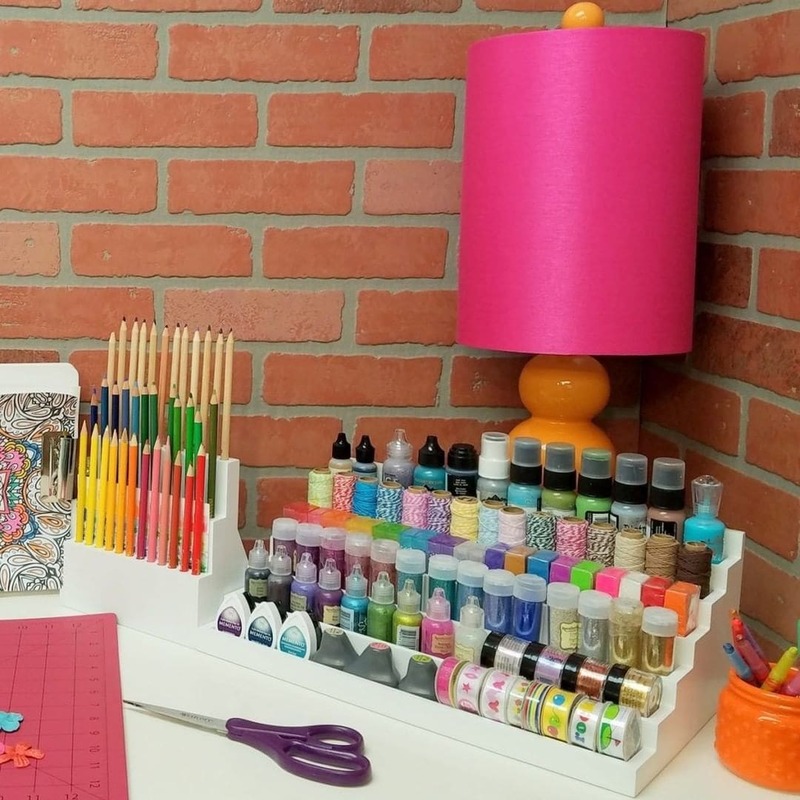 Make your own paint organizer with a wooden board, a few nails, and a few wire baskets. You can nail them down and pile up all the paint tubes. Simple, looks very creative and does its job wonderfully! If you have a bunch of buttons, needles, small decorations lying around, it might be a good idea to organize them. This plastic container is just for that. Get one just like in the picture here. This one is pretty simple but absolutely essential to keeping your room organized. Get tall shelves, the taller the better. The more shelving you have, the more space there is for all the supplies. The more supplies, bigger the inspiration to get things done every day. So, if you have a little bit more money to invest, definitely get a wooden shelving unit. I bet you’ve seen some of these display racks in the office supply shops but have you ever considered getting one for yourself? If you work with paper all the time or cartoon, this might be a great option for you. Organize all paper and have easy access to whatever color you need. You can get one here. 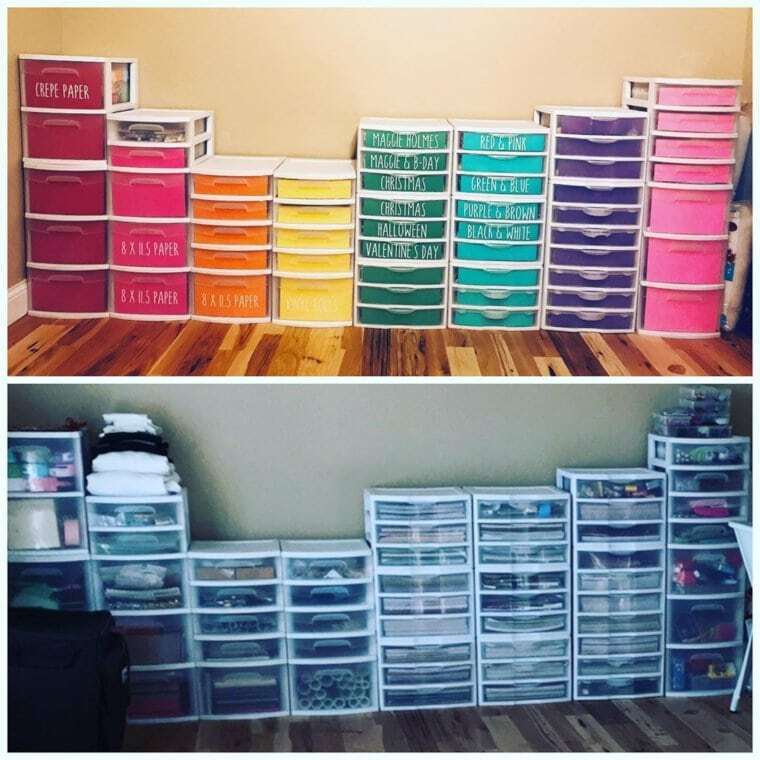 If you do end up buying a pegboard, plastic storage bins will definitely do the trick. Get the color you want here and create more storage even in the darkest corners of your room. If you love making cards or drawing, it might be a good idea to keep everything organized. Nobody wants to search through the pile just to find the right card! So, use stickers, paper cards or whatever you want to keep your portfolio organized. Not sure how to organize them all? Well, try labeling your work by dates – month and year will do. Otherwise, use whatever system that suits you best. Pencil holders are great for not just pencils. Use them to store brushes, markers, sticks, or anything else that would get lost otherwise. Get creative, introduce a few colorful objects here and there and make the whole room livelier. Small details like that do matter. 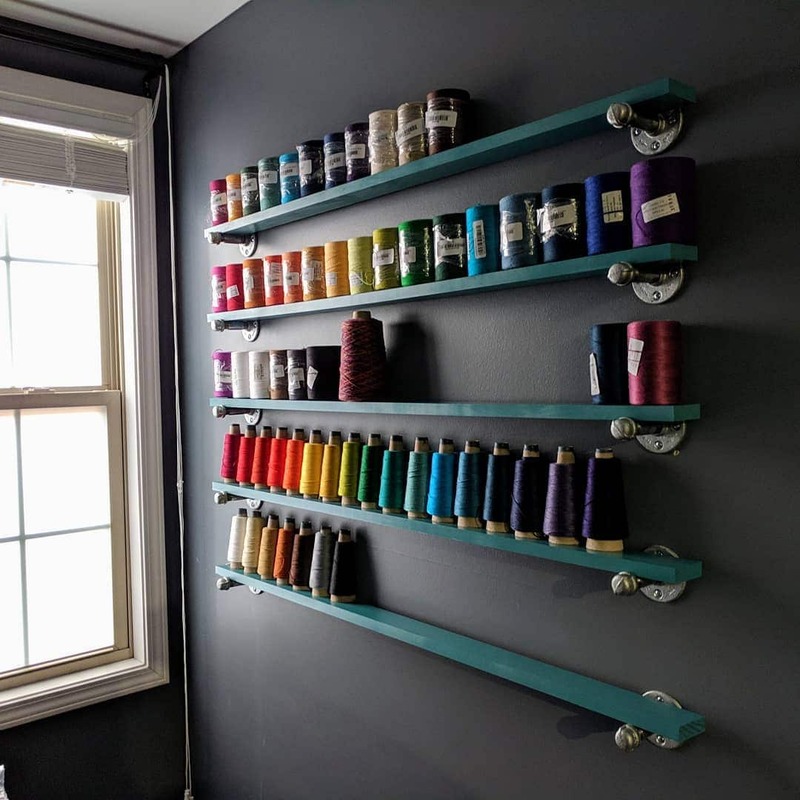 Getting a door/wall rack like this one here for a craft room can be super useful. That’s mostly because it’ll save you a ton of space. Also, it’s just a very practical way to get everything organized. 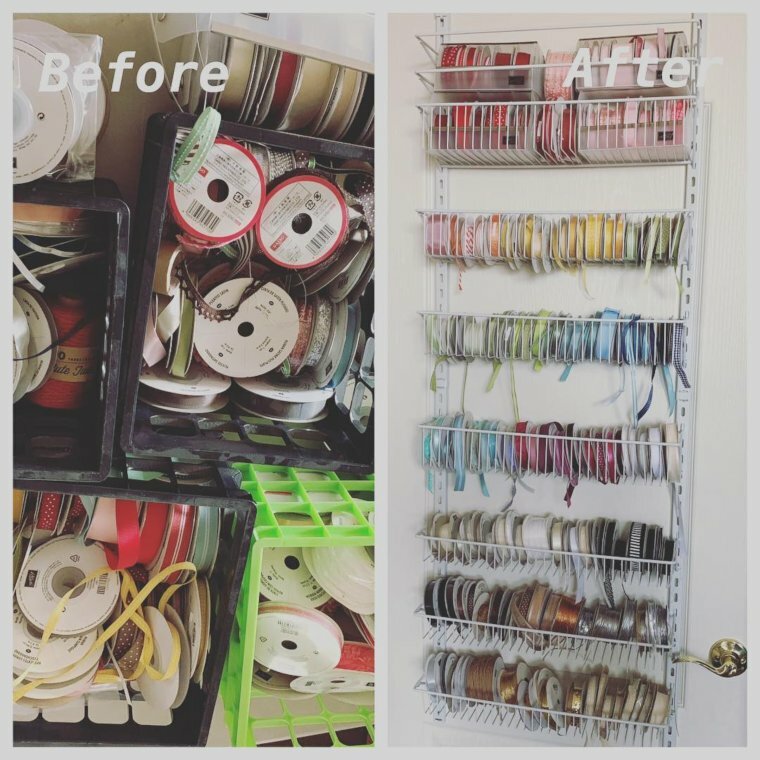 So, if you have a bunch of ribbons, threads, paint, and have absolutely no place where to put them, get one. 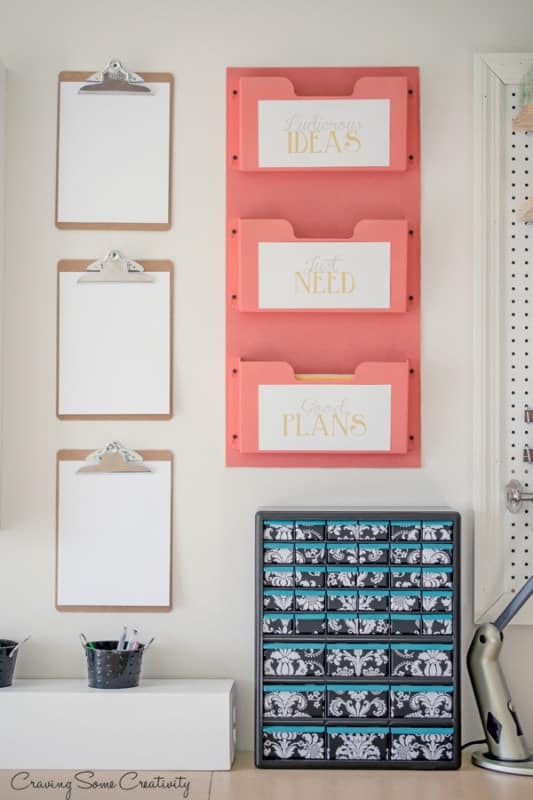 Get creative, have fun and have things organized in a more interesting way! 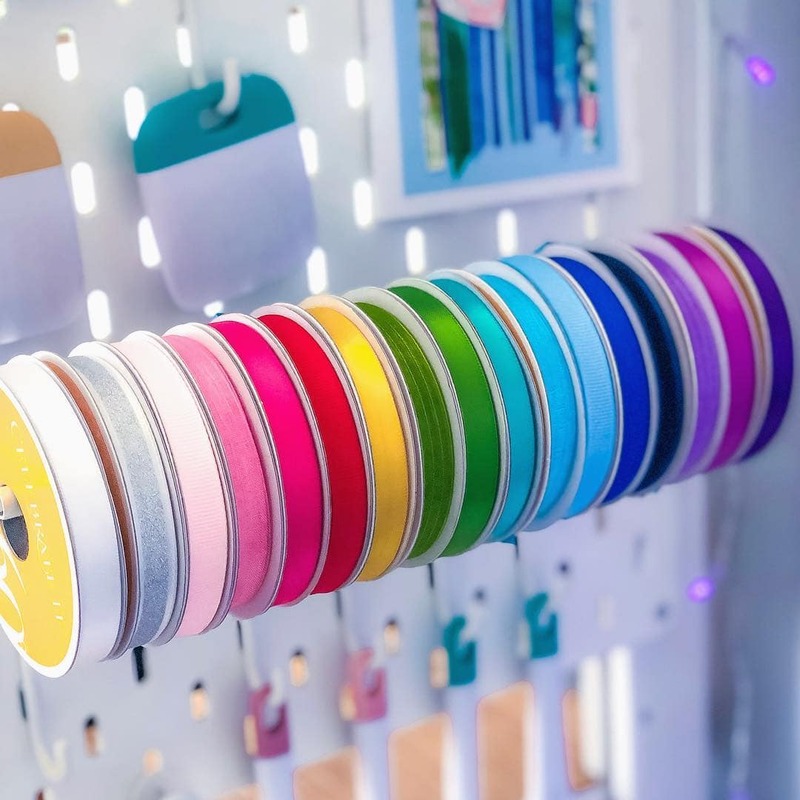 There are a lot of tiny supplies that you have to store in your craft room. Things can get messy! That’s where having a craft cabinet with smaller sized drawers can get very handy. It does look appealing to, so definitely get one. 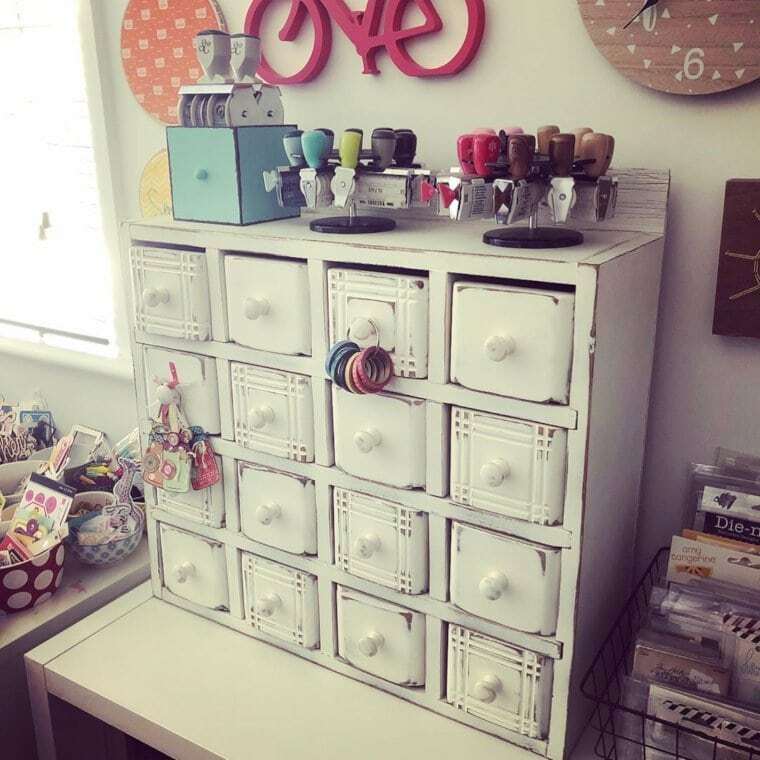 You can always start with a plastic craft cabinet if your budget is tight like this one here. Or invest a little bit more and get a wooden one. 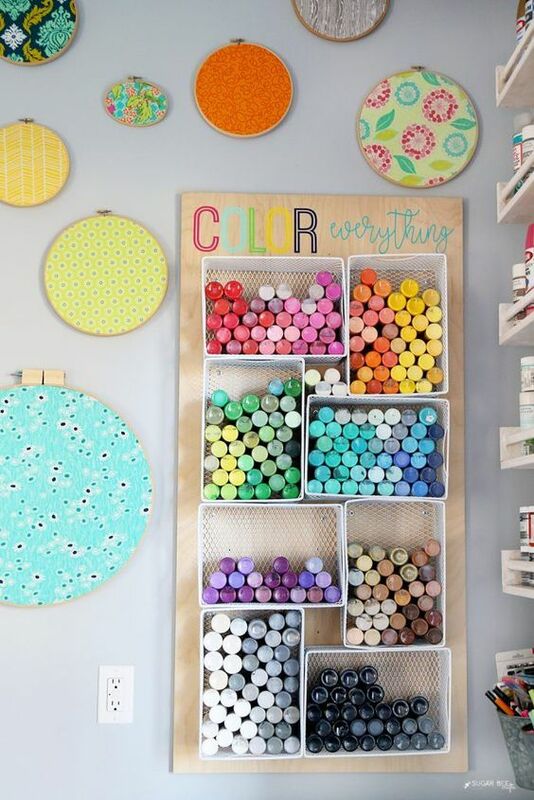 If you love planning your crafts, you should definitely start organizing them. That’s where a mail organizer comes in handy. 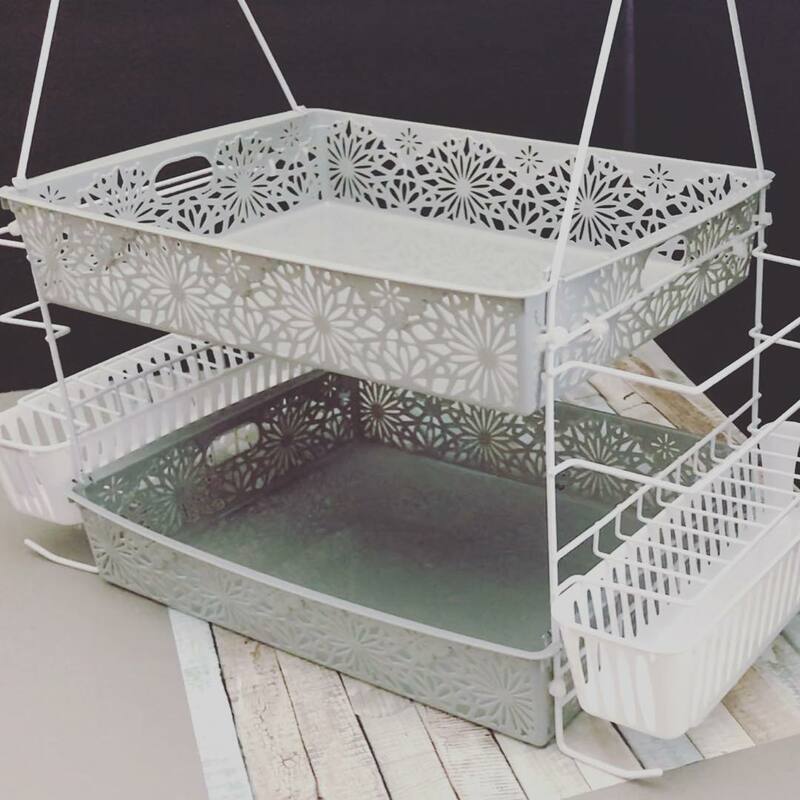 A wire standing basket shelf is an absolutely beautiful addition to any room. On top of that, it creates a safe place to store whatever supplies you need. 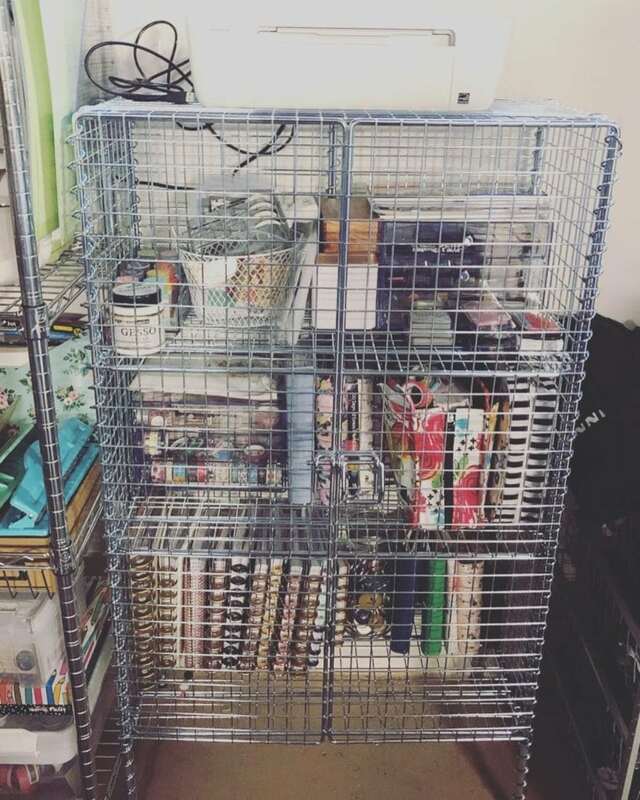 I’ve already mentioned carts in one of my posts about organizing your office space. Well, they can obviously be used in more than one place. They’re great for organizing your supplies. Carts are especially practical when you need to move them around. If you sometimes like to move your creative space into another room, such an organizer can be very handy. 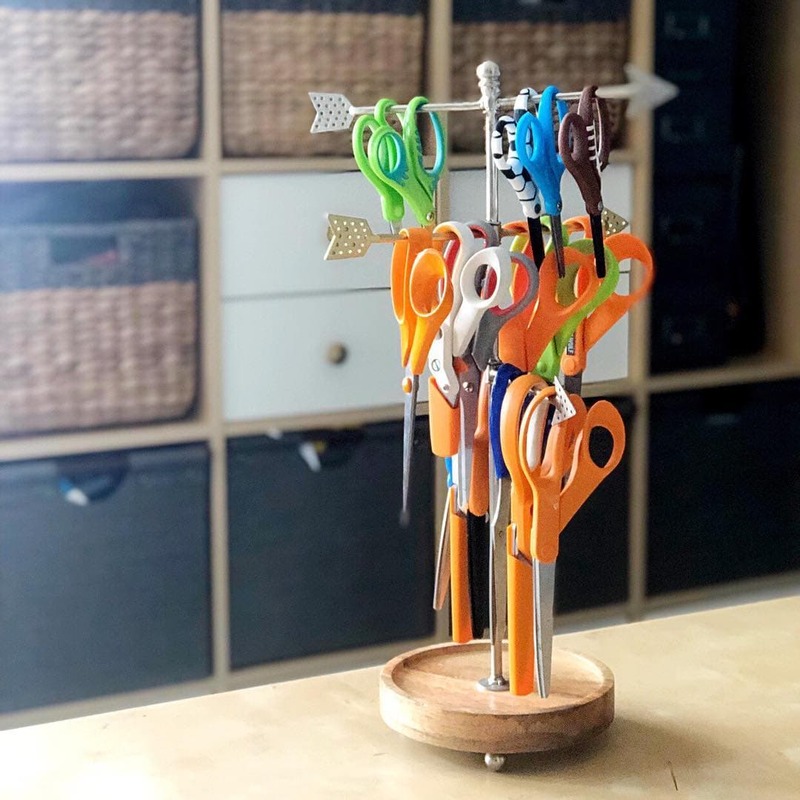 If you have a child or two and need a way to keep your supplies away from them, here is an idea. Try these wire mesh compartment lockers. You’ll be able to figure out what’s where without opening them. Also, the little ones won’t be able to get inside. A great way to avoid destruction! 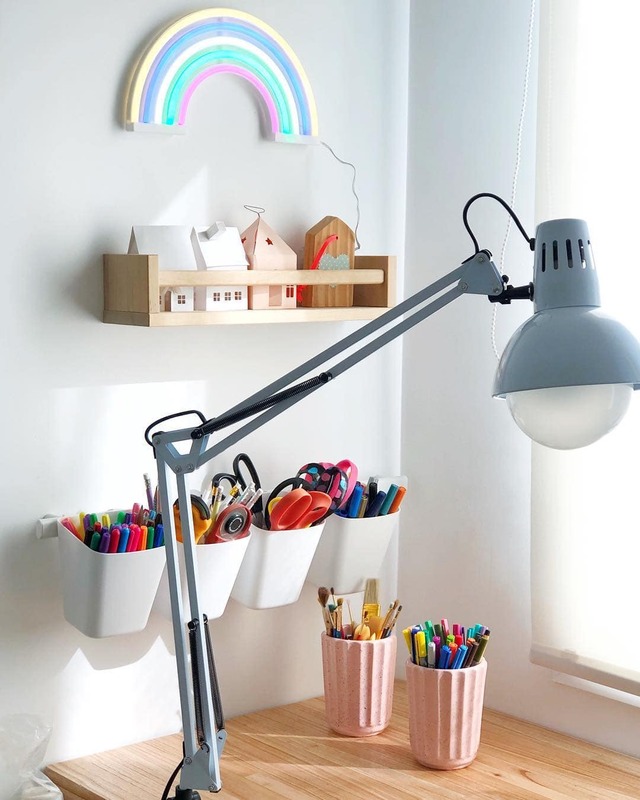 The truth is, you can get your craft room organized with a very small budget. All you need to do is go to the Dollar Store, get whatever seems proper for storage and arrange something of your own. This little organizer is a perfect example of a cheap way to get things organized. Keep it on your table or on shelves. 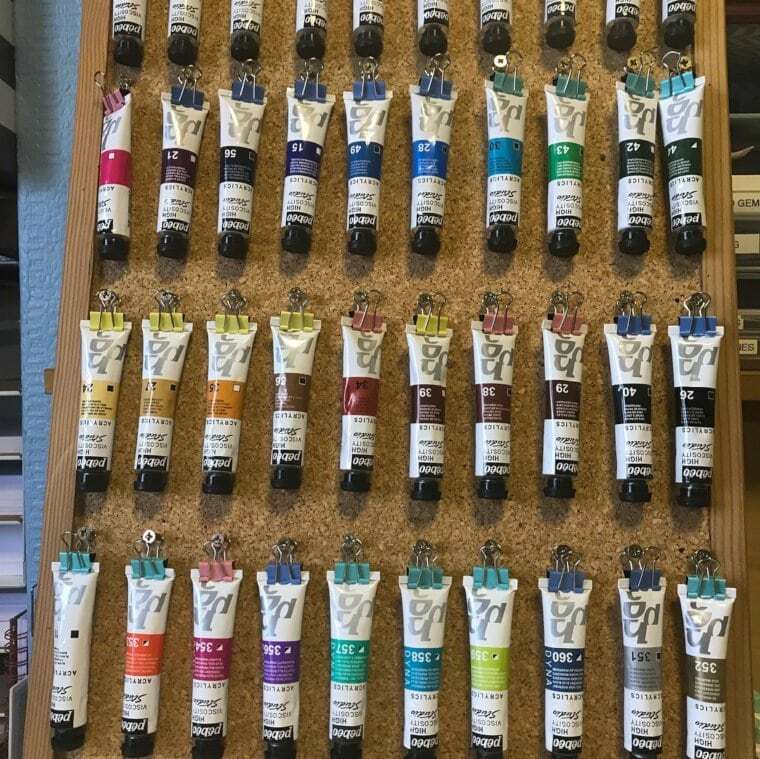 Want to organize acrylic paint? Get a bulletin board like this one here and a bunch of clips. Hammer a few nails into the board, and here’s a perfect DIY organizer. It might not look very elegant. But, it’s definitely more practical than having all of them thrown in a drawer. It’ll give you a chance to notice when you’re running out of a certain color too. If you happen to work with ribbons, fabrics or threads, it might be a good idea to install a rod on your pegboard. You could also use hooks to hang other lighter supplies. So, definitely give them a try. 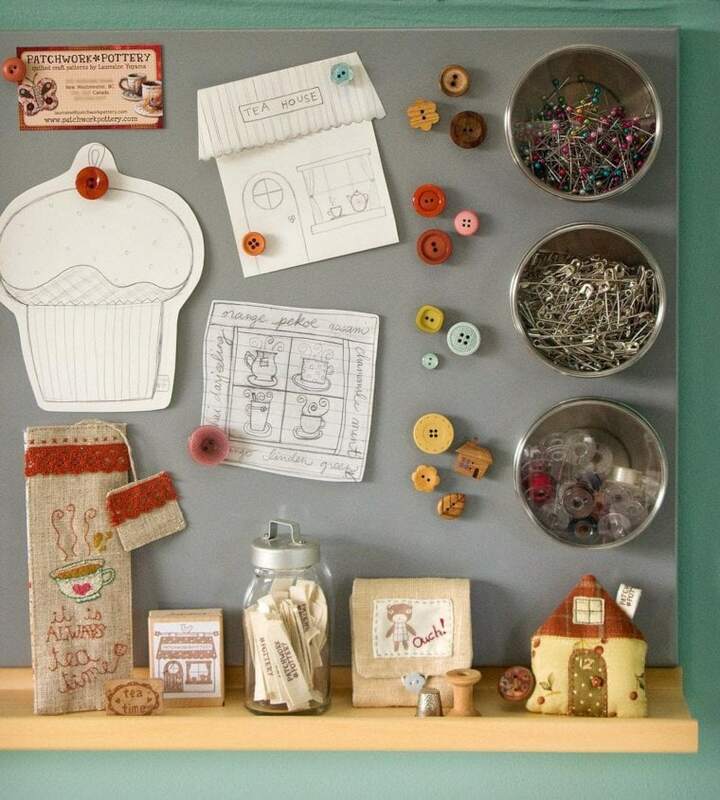 Here is a great opportunity to use the vertical wall space in your craft room, get a magnet board. It’s not only great for quick reminders and plans but storage too. 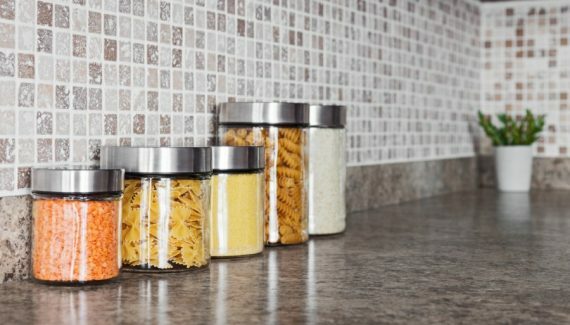 Get magnet spice tins and store anything from buttons to needles to pins. Hang one above your desk and have fun planning your time ahead. Hoping you’ve enjoyed these organization ideas. Start crafting, let your creative juices flow and create a space that encourages you to feel more like yourself.